"Don't even try messing with me because, trust me, you'll regret it..."
Personality: Rain is an, overall, secretive female, her heart sort of like a cave with the entrance blocked by rocks, meaning you have to dig deep in order to get inside the cave/heart. Rain is a very determined, ambitious, and hard-working individual. While she seems to have a coarse exterior, and it might take a while to really know her, she is a very loyal and passionate mare. Willing to stand up for what she believes in, she's not normally one to take orders unless they are above her in rank or she trusts the horse giving them, some exceptions being the Lead Stallion. Rain can be a very stubborn, almost child-like at times, and she can be the strong leader others see slipping just beneath her surface. She is rarely child-like, and most people know her as a... 'grumpy' person or a 'buzzkill', only meaning that her is very serious and hostile, not one to take kindly to strangers unless they prove themselves worthy. She is overly aggressive and quick to fight and, when she has the upperhand, is vicious, sometimes merciless, and cold, not scared/afraid/hesitant to inflict pain upon others. Cold; She is rather rude and snarky to horses she doesn't know. 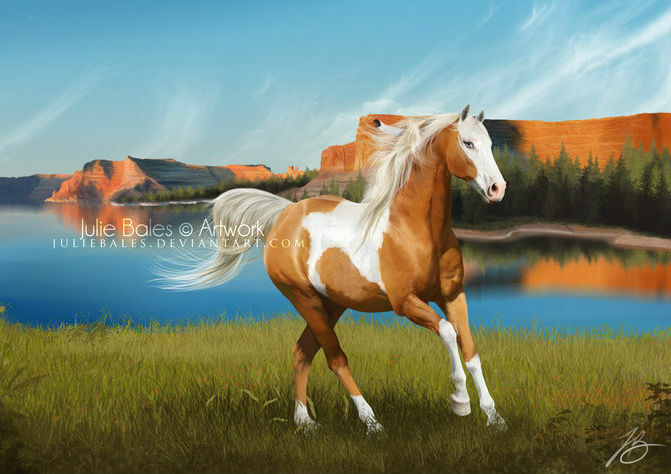 Rain is a beautiful American Paint horse with a light brown pelt and pure white 'spots'/'blotches' on it. She has rather beautiful stunning blue eyes, ones that look like a light blue crystal or gem almost, which had given Rain her name. Extra markings: A few non-visible scars. You may begin your rp!